Our understanding of people is changing. According to Steven Pinker and many other cognitive scientists, 'The Stuff of Thought' is fundamentally metaphoric. No longer do we believe metaphor is only the province of poetry and prose. No longer do we believe metaphor is a rare add-on to ordinary speech. No longer do we believe abstract concepts are the way people make sense of the world. Why? Because metaphor is deeply embedded in, and essential to language and thought. Whether we realise it or not, daily speech is peppered with metaphors — often several per minute. We can’t think, reason or interact without metaphor. Consider the internet for a moment. How could we understand it without metaphors such as the world wide web, with its pages, links, home, forward and backward navigation, pop-ups, drop-down menus, etc.? The more complex the world becomes the more we need to ground our ideas in embodied metaphors. Slowly psychology, education, health and especially business are waking up to the importance of metaphor. As examples of the latter, Gareth Morgan’s Images of Organization (1986) and Imaginization (1993) were landmark books. More recently Anne Miller wrote Metaphorically Selling (2004). Note that these books focus on the consultant’s or salesperson’s metaphors. By contrast Gerald and Lindsay Zaltman’s Marketing Metaphoria (2008) explains how consumers’ metaphors count just as much. James Geary’s forthcoming I Is An Other: The Secret Life of Metaphor will go further and show how metaphor is at work in all aspects of our personal, professional and social lives. The significance of metaphor is being studied by academics working in the field of Cognitive Linguistics. This field has been expanding since the launch of George Lakoff and Mark Johnson’s Metaphors We Live By in 1980. Coincidentally, at about that time a New Zealand psychotherapist was embarking on a quest to help heal the minds of individuals using their personal metaphors. David Grove noticed his clients commonly used metaphor to describe their painful emotions, traumatic memories and deepest sense of who they were. He discovered that once these metaphors were examined they rapidly became idiosyncratic — there were elements and meaning that only applied to the individual. Furthermore, Grove noticed that each individual’s metaphors had a structure and an internal logic that remained coherent and consistent over time. Rather than people having metaphors, it’s as if they were their metaphors. And when these changed, they did too. Grove was faced with a conundrum. If language is inherently metaphorical, how could he work with others’ metaphors without bringing his own into the conversation? His solution was a brilliant innovation: Clean Language; a simple set of questions that make use of only the most basic elements of human perception — space, event, category, attribution and intention. The combination of Clean Language with client-generated metaphors will be one of his enduring contributions. Grove’s work has remained relatively unknown partly because he wrote so little. His only book, Resolving Traumatic Memories: Metaphors and Symbols in Psychotherapy (1989) was based on recorded conversations which were edited by Basil Panzer. It was 11 years before we published our formulation of the development of Grove’s work, Metaphors in Mind: Transformation through Symbolic Modelling (2000). Surprisingly Wendy Sullivan and Judy Rees’ book is only the third to follow in this tradition. 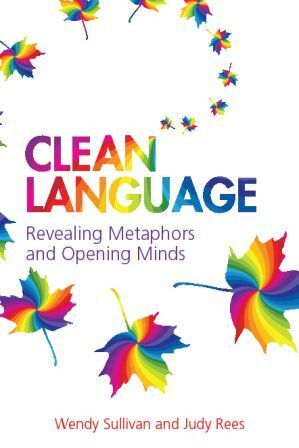 While the ‘Clean’ approach will be instantly valuable to therapists and coaches, Clean Language: Revealing Metaphors and Opening Minds also shows how it can be taken into conversations between parent and child, teacher and pupil, manager and staff, doctor and patient, researcher and subject; into team meetings, organisational development and in many other areas. Along the way the reader is made aware of how their own assumptions and intentions influence the systems in which they live, work and play. This book is part of a rising wave of interest, application and research into metaphor. We applaud Wendy and Judy’s willingness and enthusiasm to make this work available to a wider range of people by the publication of such a practical book.